(Standing on the side or behind the chapel) Look into the chapel. What do you see? What do you notice about the statue? How do you feel as you look? Is there somewhere in the chapel you would like to stand, sit, or kneel? When you feel ready, enter the chapel. Allow yourself time to get settled. Light a candle as a symbol of a deep desire of your prayer. Communicate with God about this. Sit quietly as a prayer of waiting. Sense or imagine Mary and Jesus waiting with you. What are you seeing? Let your eyes invite you into prayer. Bathe in the accumulated prayer-energy of all those who have come to pray before you. Use the written prayers that are left in the chapel by the cathedral staff. Pray the rosary or use other prayer beads to bring focus. Use the silence to “see through” the concrete into the infinite. Use the statue as an icon through which you look into God. Ask Jesus to introduce you to his mother. Talk to Mary. Tell her your story. Share your pain with her. Ask for her help. Use “Mary” or the French, “Marie” as a silent prayer word to repeat mentally (mantra) as you sit quietly in the chapel. Use “Ma” on every inhale and exhale as a way to focus your prayer. Ask Mary to introduce you to her son. Be still. Meditate for at least 10 minutes, but preferably longer. When ready, touch or kiss the pillar (as you have seen others do) or touch your head to the pillar. 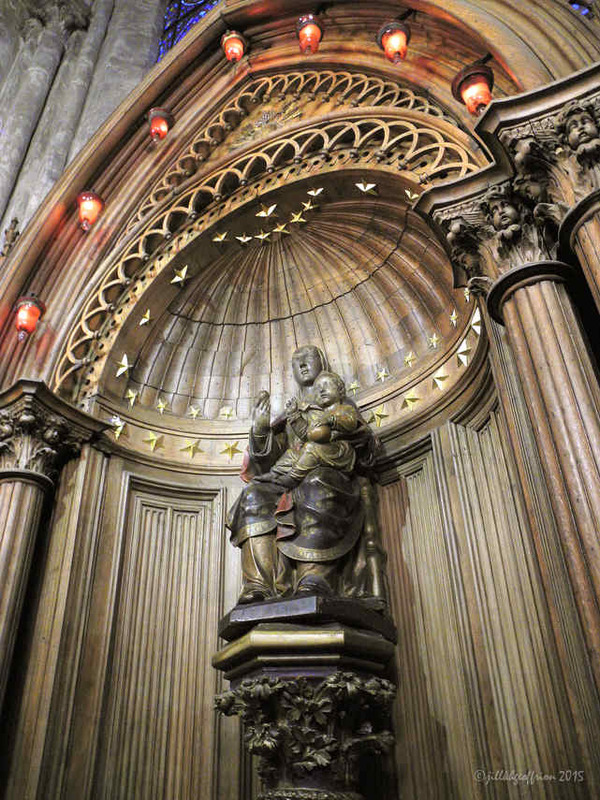 “Notre-Dame de Chartres was represented by a silver statue which was placed in the sanctuary (choir). 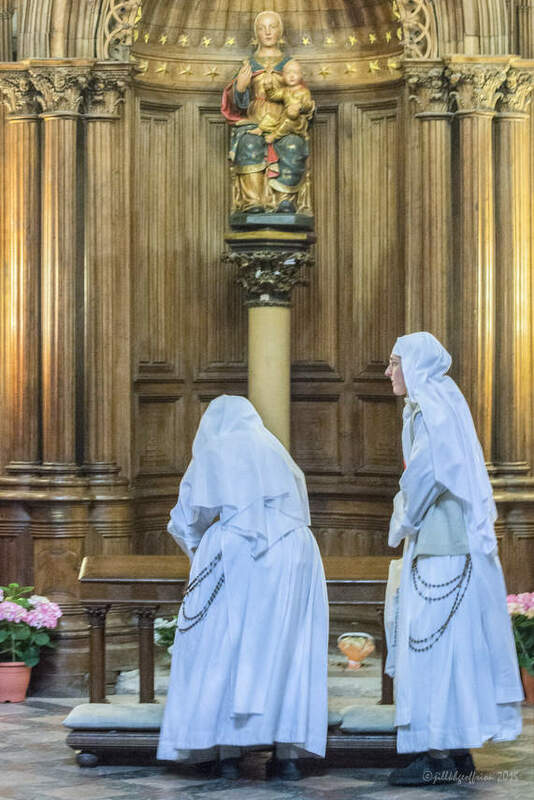 However, the flow of pilgrims cramped the liturgy, so around 1508 a wooden replica was placed in front of the nave. Since 1806 his statue has been installed in the ambulatory.” Bouttier, Michel. (1999). La Cathédrale de Chartres: Sa Construction. Paris: MB Editions, 26. 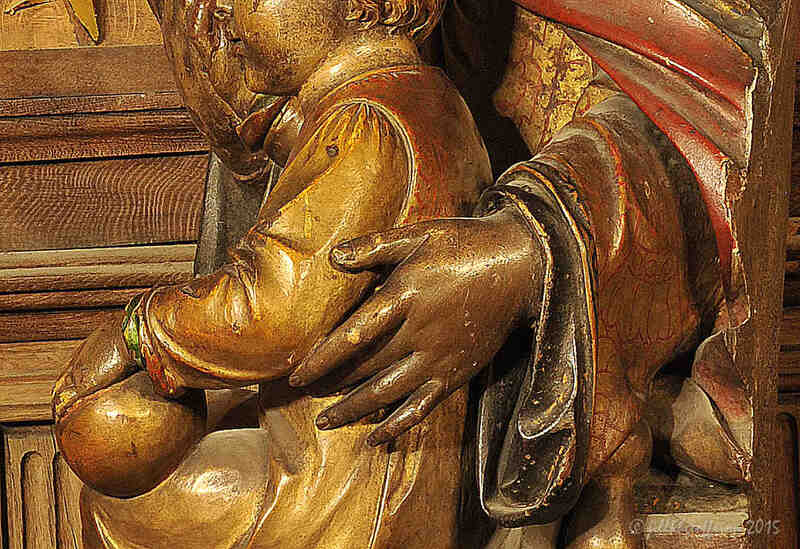 The statue of Mary and Jesus is made from pear wood. Jesus has bare feet. Mary has shoes on her feet. Mary’s gaze is straight ahead. She is holding a pear in her right hand. Jesus sits on Mary’s lap facing forward. He has his hand on a ball. The pillar was a part of the ancient rood screen (jubé). The two stained glass windows above the statue. 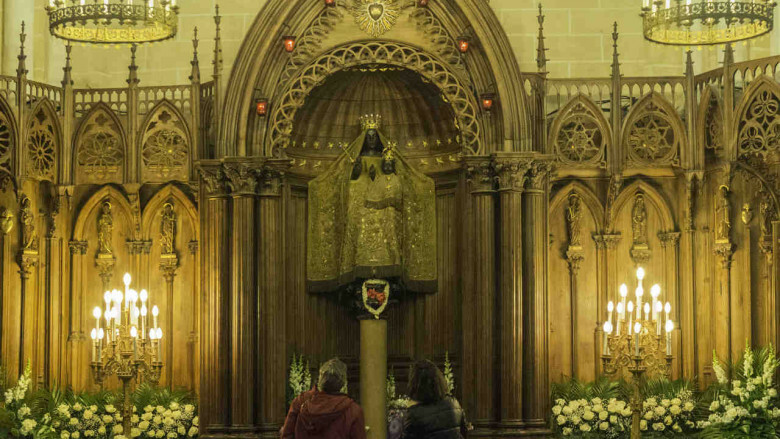 Look for the two images of the donors praying to the ancient statue of Mary of the high altar. The hearts which are signs of gratitude for prayers answered.